Today let’s continue to Energize as we move through the RENEW Total Body Detox program, fully described in Detox Strategy! I’d like to share two of my favorite movement programs with you – as I promised in my last post. As we Energize we are better able to manage stress in all areas of our lives. A rebounder, aka mini-trampoline, is an excellent detoxification tool. Most sporting goods stores carry rebounders or you can find many rebounder suppliers online. No matter your fitness level, there is a rebounder program for you. Even a “soft walk”, where you simply shift your weight from one foot to another, lifting your heels as you do so, serves to stimulate that ever-important lymph flow. Rebounding so effectively moves lymphatic fluid that it has been referred to as “lymphasizing”. In addition to clearing the lymph glands, rebounding will provide aerobic exercise (once you’ve worked up to a sustained motion for fifteen to twenty minutes), oxygenating your body. When you jump up and down on a rebounder, the force of gravity alternately pulls and then releases each cell. Toxic material is flushed out and nutrients are absorbed. During this process white blood cells are also produced. Even a short (two- to three-minute) rebounding session will dramatically increase your white blood cell production, again strengthening your immunity. Rebounding also exercises the musculoskeletal system, protects and strengthens the cardiovascular and peripheral vascular systems, and helps restore bone density. It’s best to use your rebounder at least once daily. Short, frequent rebounding sessions can be as beneficial as a single long one. You may find this a simple way to effectively manage stress. Of course, if you have health issues, always consult with your doctor before beginning any type of exercise routine. It may be difficult to find time to visit a gym inside of the busy lifestyles that we live these days. Using exercise bands for strength training allows for a work out anytime. These flexible elastic bands or tubes provide a progressive stimulus to your muscles to help build lean mass and increase your strength. 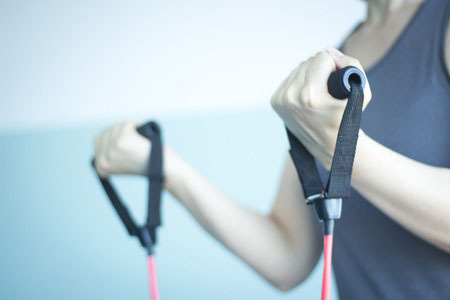 Initially used in rehabilitation setting, exercise bands are rapidly becoming common in a variety of fitness and sports settings. The bands are extremely portable and don’t take up much space, fitting easily into your overnight bag, purse or backpack. You can go through a complete workout program using just a couple of bands with different resistance levels. And you don’t need a lot of space to do your routine. Perhaps one of the most valuable aspects of exercise bands for me personally is that they don’t aggravate my chronic neck problems. People with pain issues can safely and comfortably work with resistance bands in a number of effective ways. Bands don’t rely on the force of gravity to provide resistance like exercise machines and dumbbells. Instead, it’s the stretching of the band that creates the resistance: the further you stretch it, the greater the resistance. Simple, safe and easy to manage. Not only do the bands increase strength, but they also help build flexibility, power, balance, and speed. And because they improve circulation, they help you maximize your body’s detoxification at the cellular level. Extra added benefit – they stimulate burning off fat, which eliminates more toxins, while increasing lean muscle mass and improving your overall fitness! And all these improved functions will serve to help you manage stress with ease. To Energize, sometimes we need to exercise more than our physical bodies by addressing and nurturing that all-important mind-body connection. I’m a big believer in engaging in activities that help one cope with inevitable stress and create a relaxed mind. We all live busy lives and typically have more to-dos than we can possibly handle. Learning to relax both mind and body is the key to inner peace, increased confidence and a sense of wellbeing. More accomplishment will be yours, both at home and at work. You’ll feel more alive and capable to handle whatever stressors may present. I have blogged often on the importance of getting enough sleep to reduce the stress levels in your body. Just about every system in the body, including the detoxification process, is affected by the quality and amount of sleep you get nightly. A full eight hours has been found optimal to maintain your metabolism and supporting hormonal balance. Establishing habits that support healthful sleep patterns will result in boundless rewards in the areas of vitality and energy. For some people, physical exercise is enough to de-stress and provide much needed relaxation. For others, a practice such as yoga and mediation prove more effective. As I mentioned previously, I find yoga to truly help me become more attuned to my body and its needs. I’m able to tap a source of renewed strength and spirit to deal with life effectively. Your personal journey to manage stress can take many forms. Many people find great value in counseling or perhaps reading and listening to enlightening material. Whatever form works for you, choose to engage regularly. Dedication to the practice of decreasing stress, perhaps more than any other pursuit, will reward you with the life you love to live.